Work continues on the draft environmental study of extending the Green Line from Redondo Beach to a new transit center in Torrance, as well as other possible options for improving transportation in the South Bay area. Metro will hold three community meetings beginning Wednesday, April 6, to update the public on the South Bay Metro Green Line Extension project. The purpose of these meetings is to seek public comments and input as the environmental process continues for extending transit service farther into the South Bay to improve mobility in southwest Los Angeles County. Metro is currently preparing a Draft Environmental Impact Statement/Environmental Impact Report (DEIS/DEIR) to identify transit improvements that would provide an alternative to the I-405 corridor by accessing the regional transit network through connections to the proposed Crenshaw/LAX Transit Corridor, currently under environmental review. As part of the Draft EIS/EIR, Metro will assess existing conditions in the study area, further refine the project alternatives, assess their potential impacts and identify possible and reasonable mitigation measures as necessary. The Light Rail ‘Build’ Alterative being considered in the Draft EIS/EIR evaluates extending the Metro Green Line from its current terminus at the Redondo Beach Station to the proposed Torrance Regional Transit Center (RTC). In addition, the Draft EIS/EIR will evaluate the No Build and Transportation Systems Management alternatives. The public is encouraged to attend the community meetings and provide their input. The meetings will provide a project overview and update on the draft environmental process. 1-800-266-6883 or visit www.metro.net/southbayextension for additional information. I’ve done some independent study of existing lines. As far as I can tell, I think this is a huge waste of resources. The Green line, as proposed, would meander like a snake. For trips to/from Redondo Beach & Torrance, existing bus lines would be faster taking the Green line for most feasible trips. I’m in favor of rail lines that would save time and resources over existing bus lines. This is not one of them. 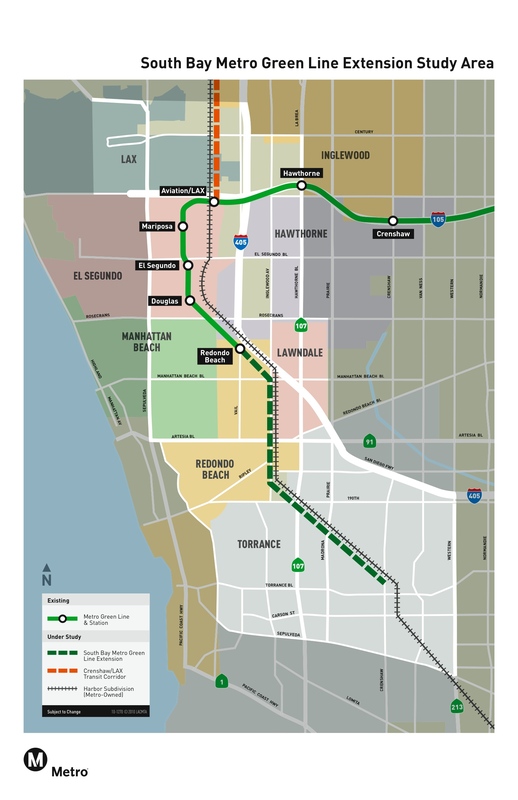 Metro plans to have the Crenshaw Line trains continue onto the South Bay Green Line extension, forming a new north-south corridor parallel to the Blue and Silver Lines. Metro, you should grade separate this extension. The entire existing Green Line is grade separated. Why break with the pattern now? The Green Line has a much better safety record than the Blue Line and a faster travel speed (granted this has a bit to do with the station spacing). Spend the money to build a quality line. The line needs more transit oriented development to boost ridership, especially on the western end where it’s a massive landscape of wasteful parking lots and office buildings. Hopefully you can work with the cities to make something happen over there. Also, I know there’s no money for it now, but it would be awesome if this eventually got to San Pedro. That seems like an area with some good transit potential, and it’s kind of pointing that way. This is one of those really misleading project names. This is for all intend and purpose the Southern extension of Crenshaw line, not the current Green line. So as you can see, this extension is pretty critical for South Bay residents that want to commute to their jobs in Westside or Mid City. I don’t understand why the green line is the only fully grade separated LRT line to be built. After the freeway, its on an EL structure for the rest of its route and that’s not even a dense area, yet we have at-grade street running with no signal preemption in some of the densest parts of LA. It simply does not make sense. Anyway, this line should be built out to San Pedro. Have it connect to the blue line in long beach, then you start to resemble a transit web they way our freeways web their way all across LA county. Same for West LA regarding the expo line connecting to the sepulveda corridor/ valley line. What can also be done is extend or build a branch for the green or crenshaw line over the ex atsf redondo branch which is now the harbor green belt to Manhattan beach thus entering a more densely populated area. Building to the proposed terminal in torrance is not bad remember the more the better the purpose is to provide and alternative than just driving in your car. Building the branch on the green belt would provide south bay better access to the West and East sides and LAX.